Whether you’re looking for a way to celebrate a birthday or anniversary, or you just want to spend some quality time with your special someone, traveling is always a wonderful idea! Take off with your sweetheart and enjoy some time in Albuquerque, NM. Romantic weekend getaways in New Mexico are always a great idea; this area contains some wonderful attractions and activities that the two of you will love. Better yet, Albuquerque is also the home of the Bottger Mansion of Old Town, the ideal bed and breakfast for an intimate trip together. Discover why you need to book a room at the Bottger Mansion during your romantic getaways in New Mexico and start arranging your travel plans today! The Bottger Mansion of Old Town is a picturesque setting for couples to spend time together. Each cozy room offers lovely views of the surrounding, historic city. Couples will love the comfortable beds, gorgeous furnishing, and deluxe private baths (one even has a luxurious Jacuzzi tub!). In the morning, the two of you will be treated to a hearty, delicious homemade breakfast. Some of our finest breakfast dishes include our Green Chile Quiche, Orange French Toast, Blue Corn Pancakes, and our Blueberry French Toast Casserole. You can either eat inside or outdoors on our relaxing, shaded patio! After filling up on our delectable breakfast, go out and explore the city! There are numerous romantic things to do in Albuquerque, NM, like taking a scenic ride on the Sandia Peak Tramway or observing adorable animals at the ABQ BioPark. If you want to have an intimate dinner together, there are plenty of romantic restaurants in Albuquerque for the two of you to have an unforgettable meal together. You’ll find plenty of options for entertainment and nightlife as well. 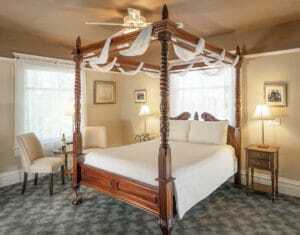 The Bottger Mansion has a wide variety of outstanding specials and packages that are designed for couples. We have a Lovers’ Special, a Balloon Ride Special, and even New Mexico Elopement Packages! We also offer some amazing romance add-ons, like a vase of roses or box of chocolates waiting for you in your room. We want you to have the most romantic experience here possible, so be sure to take a look at everything we have to offer here at the Bottger Mansion! What are you waiting for? Book your romantic getaways in New Mexico today! If a trip to the Bottger Mansion of Old Town sounds like the perfect getaway for you and your significant other, don’t hesitate; book your stay with us today! With our delicious dining and peaceful environment, you will never want to leave our peaceful oasis in New Mexico. Check our availability and start planning the vacation of a lifetime today! To learn about even more romantic things to do in New Mexico, download our free Vacation Guide today! This incredible resource offers everything you need to know about the best things to do and see in Albuquerque, New Mexico.